Supermarket giant Sainsbury's is to take on Amazon and offer up ebooks to its online shoppers. Sainsbury's has been busy building up its web services for a number of years now but its latest acquisition could well be the company's shrewdest yet. It's bought up HMV's stake in ebook store Anobii – which equates to 45.5 per cent of the company – and added in a few more shares for good measure, taking its share total in the service up to 66 per cent. As Anobii was something of a loss maker for HMV, Sainsbury's didn't have to dig deep for the shares, buying them for just a pound. But where HMV couldn't do anything with Anobii after it sold off Waterstones, Sainsbury's reckons the store will be key to its online services going forward and perfect for rivalling Tesco, which already is up and running with its own ebook site. Speaking about the deal, Mark Bennett, Sainsbury's Head of Digital Entertainment, said: "Anobii's innovative use of social media is a clear differentiator. This acquisition is a valuable addition to our digital portfolio and shows our commitment to becoming a key player in the digital entertainment market. "It further demonstrates how we are constantly looking to innovate and seize opportunities that will support the future growth of our business. We're excited about working together with the Anobii team and our fellow shareholders in supporting Anobii to become a leading retailer of ebooks." The 'clear differentiator' Bennett is talking about is to do with Anobii's social sharing – the site links into a number of social-networking sites and already has a member base of 600,000. 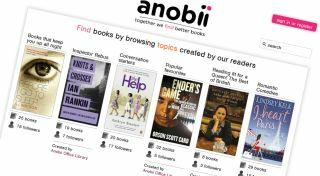 According to Sainsbury's, there are currently 60,000 ebooks available from the site and HarperCollins, Penguin and Random House Group are shareholders in Anobii. And for those who only know their latin from Harry Potter spells, Anobii apparently means bookworm - well, its variant Anobium Punctatum does. Sainsbury's will be hoping it also means money spinner.